My days are seeing something new and wonderful – warmer temperatures, longer days, and free time to get outside. With these delightful improvements over snow, ice, and below-freezing wind chills, I’m taking every advantage of them that I can. I’ve gotten outside and walked. Then, the other day, something new and cool happened. I was walking and feeling a little winded. That didn’t make sense, since I’d already done cardio two other times earlier in the week. When my fitness app gave me my 1-mile progress report, I discovered why I’d felt winded – I was averaging 3.8 miles per hour! Talk about some hustle, and that’s a pretty significant improvement over last year at this time! Then something totally new happened. I was into my second lap, and my stride shortened and my steps quickened, and next thing I know, I’m jogging and loving it! Except for up and down the football pitch with kids, I haven’t jogged since high school. 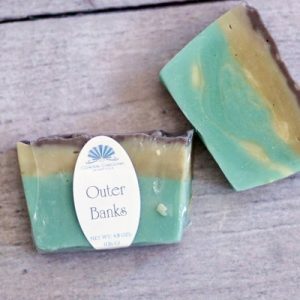 Outer Banks Beer Soap. Ideal for men, but perfect for both men and women. 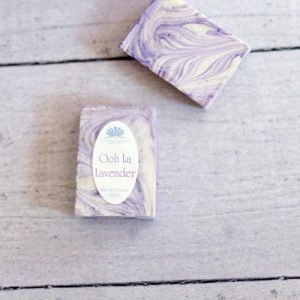 using a bar of a vintage beer soap from my old brand, but if I were to use any soap I have on hand, this time of year just screams for Lavender & Goat Milk. Goat’s Milk & Lavender Lotion – all natural with oodles of skin lovin’ stuff! Goat’s milk has awesome skin-loving vitamins with antioxidant properties, and the lavender simply soothes the soul. This soap leaves my skin soft, supple, and moisturized – perfect for everyday skin comfort. Truth: Right now, I’m wearing pants all day every day, which means I really don’t care how my legs look. When I do care, like when someone may actually see them, I follow my shower with a light application of Orange Blossom & Amber Body Creme. Not only does it smell heavenly, but the blend of coconut cream and avocado oil slays the alligators my legs can become on the driest of days. moisture that doesn’t leave skin greasy. Plus, its light floral scent lingers gently all day without clashing with your favorite body scents. One customer said that it makes her skin look bronze (there’s no coloring added). Another commented about how it makes her skin glow. This creme is fabulous for either day or night! Once I’ve exercised, washed, and moisturized, I’m ready to tackle anything the day can throw at me! Taking just that little bit of time to pamper my skin feels luxurious and indulgent, which is a great way to kick off the day! I hope you’ll join us tomorrow, Tuesday, 23 January, as I go live talking about these awesome products and sharing some new discoveries I’ve made in pursuing the healthy coastal lifestyle. 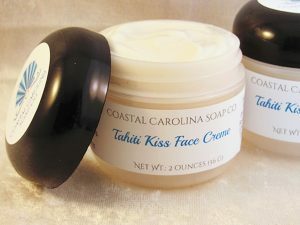 You can join us at noon eastern in the Coastal Carolina Soap Co. Facebook group. What Do You Say to Body Creme? Ages ago when I was making smaller amounts of lip balms (not many hundreds a year), I ordered my tubes from Rustic Escentuals/Aroma Haven, a supplier out of South Carolina. Their prices were fair, service was great, but the UPS shipping was brutal! Let’s face it: Lip balm tubes and caps are not terribly bulky or heavy to ship. At around this same time, I discovered a then-Kentucky-based company that offered the same product for a comparable price, but which had a priority mail shipping option, which cut my shipping in half or more per order. I abandoned AHRE for that particular product. The second company moved operations from Kentucky to Colorado, and the shipping went up accordingly. (Hey, I get it. It happens.) Over the past couple of months, I have gone back to buying smaller quantities of tubes at a time from AHRE. The per-item price is a titch cheaper (we’re talking a fraction of a penny here), the shipping still makes my gut clench, but the basic, cheap-o Fedex home delivery is here the next day if I place my order before lunchtime. This amounts of overnight delivery without paying a premium for it! I placed my first order in a long time with AHRE and was delighted to have the opportunity to get a free fragrance sample. I LOVE sniffies, and when I get enough of them, I throw down a batch of one-hit wonders. Being on the seemingly endless search for a good Orange Blossom fragrance, I happily clicked the button to add a free sample of Orange Blossom & Amber fragrance oil to my cart. Imagine my surprise and delight when my package arrived the next day (overnight shipping – woohoo!) and I discovered a one-ounce bottle of fragrance! With a happy mix of excitement (Hope it smells awesome!) and trepidation (What if it smelled awful? ), I opened the bottle and took that first sniff. It smelled amazing! It’s got the orange blossom scent I was expecting with bottom notes of warm, musky amber. The question came, What to do with these 28ish grams of awesomeness? I had a small amount of coconut avocado lotion base in my shop fridge, so I warmed it a little bit, added the fragrance, and poured it into bottles. The largest bottle made it into my backpack. The rest of the lotion went into the adorable little white bottles you see up there ^^^ to be shared with you, my customers. This, of course, led to another question… I used to offer a line of luxurious body cremes, and with winter’s dry air coming, is this something you’d like to see again? This would be a limited time offer of a very exclusive variety of scents, and I’d use the to-die-for coconut avocado lotion as the base. 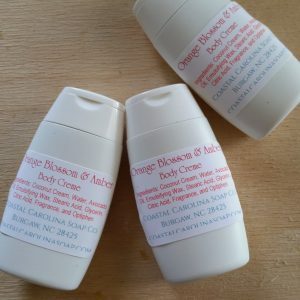 In the meantime, I have three samples of this Orange Blossom & Amber creme available, and the next three customers who order will receive one so you can see what has me so excited. Again, would you like to see a limited engagement of body cremes for the winter? And what fragrances would have you turning cartwheels? Posted on October 23, 2017 Categories Bath and BodyTags amber, body creme, lotion, orange blossom, samples2 Comments on What Do You Say to Body Creme? Why am I sharing this? Because I want to show you that chemicals are not our enemies and that going “all natural” when drugs do a better job is not the smartest choice long-run. Chemicals are all around us: Air, water, food, soap – things we put on and in our bodies – are all chemicals. Try living a life free of chemicals and see how long that lasts. Short answer: Three minutes. That’s how long we can go without air before we die. Chemicals are in drugs that we may use on a daily or occasional basis – multi-vitamins, blood pressure meds, and ibuprofen are all safe chemicals that help our bodies. Although it doesn’t seem like it, sunscreen, too, is classified as a drug, because it changes the makeup of our skin to prevent the damage caused by UV rays. I’ve heard the concerns. “The chemicals will get into our skin and poison us.” “These chemicals aren’t safe.” “Those chemicals killed laboratory rats.” Let’s look at each one of those. “The chemicals will get into our skin and poison us.” Our skin is an incredible organ! It releases toxins through sweat, it protects our muscles and internal organs, and it helps insulate our bodies. As it protects, it forms a pretty impenetrable barrier against harmful – or not-so-harmful – things that want to get into our bodies. We come into contact with millions of bacteria a day that never get inside us, because they die on the skin. We take showers or go swimming, and as small as a water molecule is, we don’t bloat up with all this water getting inside of us, because the skin prevents it from happening. If our skin can keep something as small as a water molecule out, how in the world could a larger, more complicated nanoparticle of a chemical get past the skin barrier? It can’t, plain and simple. So, since these chemicals cannot get into our bodies through our skin, then they can’t poison us. In fact, the only way these would be harmful is if we were to drink gallons of sunscreen. Ew. Just… ew. 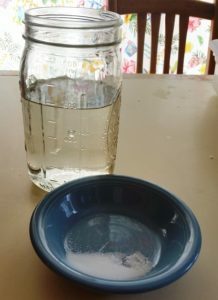 So you decide to avoid these chemicals and either take your chances with homemade, untested sunscreen or go without altogether – because you want to avoid chemicals. Or worse, you’re applying these products to your children, leaving them no choice in how their skin is protected. It’s ten or twenty or thirty years down the road, and you or they have skin cancer, a particularly nasty melanoma that has also started affecting your internal organs. You have a decent chance of survival – with chemotherapy. So now your oncologist is going to inject a stew of chemicals into your body to counteract the consequences of not applying chemicals topically when you were younger. That’s a pretty sucky trade-off, especially since applying sunscreen generally doesn’t make you exhausted, sick, or bald. 2. “These chemicals aren’t safe.” Properly prepared sunscreens are tested rigorously by the FDA, tests which are incredibly expensive to have conducted. I’m not so naïve that I believe the FDA never approves anything which is unsafe, but in the matter of sunscreens, I have yet to see any evidence, anecdotal or empirical, of harm coming to people who use sunscreens responsibly (e.g., not drinking it) or regularly. 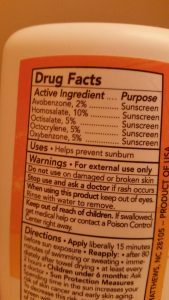 Bottom line, using sunscreen with all its “chemicals” is far safer than not using it or using untested sunscreen. 3. “Those chemicals killed laboratory rats.” Do you remember saccharine? It was the artificial sweetener of the 70s and 80s. And on each pink packet, there was the warning, “This product has been known to cause cancer in laboratory animals.” Great scare tactic! When people started digging deeper into this, they discovered that the labs were basically overdosing rats on the stuff, injecting them with far greater amounts than even the most ardent Tab drinker was likely to consume. (As an aside, I found it interesting that, when I was pregnant in the early 2000s, saccharine was the only artificial sweetener universally considered “safe” for fetuses.) The individual chemicals in sunscreens are tested similarly, though finished sunscreen is tested only on voluntary human subjects. So, if commercially manufactured, FDA tested sunscreens are generally recognized as safe, why do makers willingly put people at risk by marketing handcrafted, all natural sunscreens? They’re banking on fear and ignorance. I’ve seen makers do this, though the ones I know personally aren’t doing it out of malice. They’re just passionate about their products and their all-natural niche, and they want to offer an alternative to their customers. Unfortunately, this is a terribly dangerous practice that is spreading, despite the FDA firing off warning after warning to small, independent manufacturers for selling untested drugs and making drug claims. If you haven’t seen it, yet, I posted a link to a video this morning to my page that examines the dangers of handmade sunscreen pretty thoroughly. It’s several minutes long and easy to understand, even if, like me, Biochemistry isn’t your second language. Given a choice, do you prefer having your drugs on your body, or in your body?